A Fabulous Day Trip from Rome includes a tour of Civita di Bagnoregio and more……..
Inclusions: Private transportation, driver-guide service, tolls, parking, taxes. This privately guided day tour takes you along the pilgrim’s road, or Via Francigena, from Rome to Montefiascone, perched on a volcanic ridge surrounding Lake Bolsena. Medieval Montefiascone has many claims to fame, including its acting as a safe haven for popes, often forced to flee from the Papal Palace of Viterbo. The 12th century San Flaviano Church consists of two buildings, one on the top of the other. It is also an important agricultural center known for its wines, most notably “Est! Est!! Est!! !” wine, which dates from the year 1000. 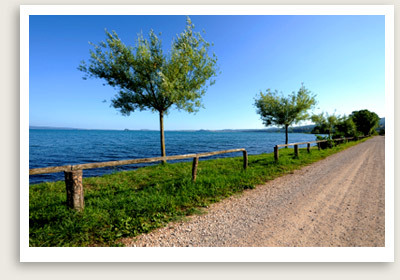 You will continue your drive a little further to reach Bolsena, located on the shore of the volcanic lake of the same name. Lunch is suggested here at Trattoria da Picchietto, known for its local cuisine and fresh lake fish. After lunch it is possible to visit the church and tour the catacombs of Santa Cristina, made famous for the Eucharistic miracle of the Corpus Domini that occurred in 1263. Other interesting sites here include the Monaldeschi Castle, the town museum the Palazzo del Drago.